MI6 and CIA be damned! 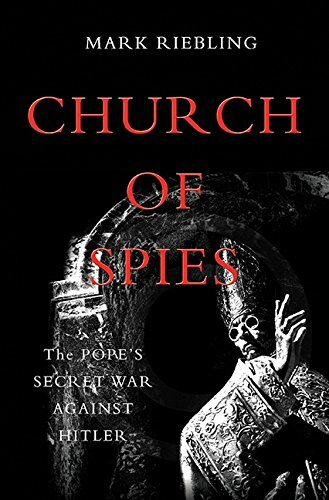 The Vatican and Pope Pius XII during World War II could have put any espionage agency to shame. It’s hard to read this book without expecting to see a movie trailer racing across the TV screen, and yet this is a story of truth and dedication to a belief. This could be very well why the pope’s public speeches made no reference to “Jews” until the very last day of the war, and why he is so criticized for that. That is not to say, however, that the references were not there, embedded with other references, when he spoke of the horrific acts carried out by the Nazi regime. The cast of characters is worthy of a major war drama, primarily because it was exactly that—a major war drama. Players emerged from the Vatican, the Jesuits, politicians, and even German military, each with a role to play. Characters from all walks of life took on roles in these plots, and it is hard to believe that Adolf Hitler survived the various attempts on his life. But with every failure, another plan emerged. One of the most difficult concepts to grasp is that with the many players, there was little seepage of information to the enemy. While we all like to see the protagonist and his or her minions come out on top, Riebling paints an interesting picture of many of the players on the other side. One of the more interesting is Albert Hartl, a defrocked priest and a womanizer, who was brought into the Nazi secret service by Reinhard Heydrich where he directed a group of other ex-priests who spied on anti-Nazi Catholics. He gathered information on church leaders through various sources and established dossiers on everyone right up to Pius himself. Plotting to remove Hitler was only the first goal in the many stages of espionage from the Vatican. It was obvious to both Pius and Müller that removal of the Nazi regime was only the start and much discussion occurred regarding what would happen to Germany after the war. It is easy to say that this concern was paramount to many of the politicians and military who took part in each scheme. But no secrets remain totally secret and as Hitler gets closer to confirming what he has suspected all along—that the pope is knee deep in schemes to kill him, Hitler enters into his own scheme—to kidnap the pope. It does not occur, but only as a result of a great deal of discussion from Hitler’s most trusted team. At times it is hard to keep the characters straight, but the story is so well written and the research so well detailed, that it flows from each event to the next without confusion. This book is a must for the library shelf in the den! The only question that remains is who plays Pope Pius XII when the movie is cast.